For more recent posts, go to my new blog at WordPress. There is a central, yet rarely stated, dilemma facing all who study the microscopic world: that to learn about the way that these hidden worlds are constructed, and how they work, one first has to wrench this world apart, flatten its components under a cover slip and then view them at light intensities far exceeding anything that they encounter naturally. The optical tricks we use – phase contrast, fluorescence, differential interference contrast - pile on yet more distortions yet somehow we convince ourselves that we are improving the quality of our insights. I have spent the past twenty years studying the algae that live in streams as part of the “periphyton”, those microscopic organisms that live attached to stones and other submerged surfaces. I often find myself wondering whether any alga really looks like the neat illustrations I see in books. Are these pictures no more than consistently reproducible archetypes, caricatures even, of the organism’s true form? Are we really, like Plato’s cave-dwellers, looking at shadows and mistaking these for reality? On top of this, the demand for a rigorous quantitative approach to freshwater ecology leads, if we are not careful, to the adoption of a “name and count” approach, with the data we produce being little more than feedstock for multivariate statistical programs. Ecologists studying the macroscopic world have a reference point: they can look at their data and visualise the communities, even if they did not perform the original survey. They know how the species relate to one another – which are trees, which are epiphytes, ground layer herbs, or whatever. This, in turn, informs their interpretation of the patterns that their ordinations reveal. But the ecologist of the microscopic world rarely has comparable knowledge about species interactions. 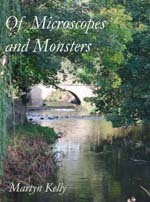 The pictures from the River Wear at Wolsingham are the outcome of a series of monthly visits I made to this river during 2009. The motivation was partly scientific – to see how the mocroscopic life on the riverbed changed over the course of a year – and partly artistic – to document this life in a series of paintings. The “science” part of the work is, to be honest, glorified natural history which has given me a pile of data that probably doesn’t add up to enough to publish a serious scientific paper although some of these data will probably work their way into papers and talks over the next few years. Each time I visited the river, I brought back a sample of the “biofilm” – the thin, slimy surface that coated the submerged stones – and examined this using my microscope. The first illustration was always a view – watercolour and pencil – looking down my microscope. Then I did a more formal analysis, naming an counting the organisms present. Finally, I tried to imagine how the community of organisms was organised before I came along and disrupted it in the course of collecting a sample. At the end of the year, I had a heap of just over thirty watercolour studies (the November sample followed a spate and was, unfortunately, almost totally devoid of life) which I then whittled down. The images presented here show the microscopic life on two of those occasions. 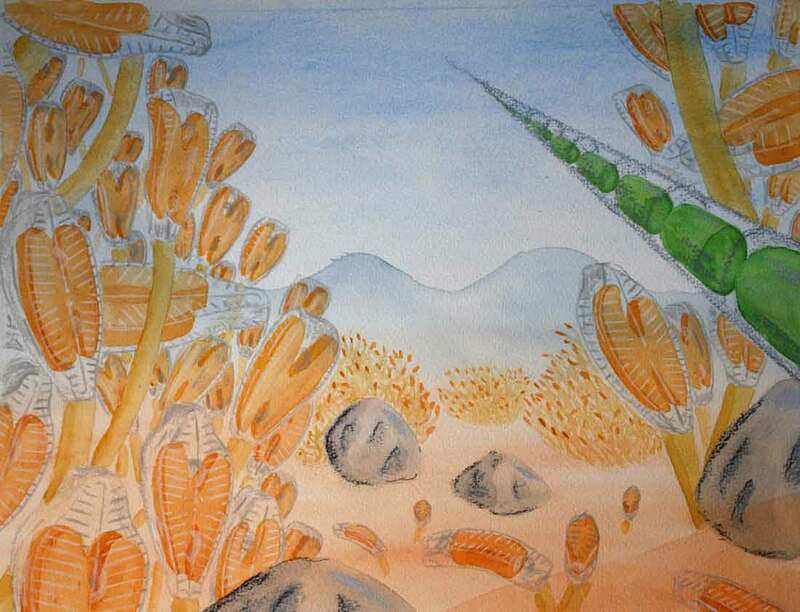 The other source of ideas that catalysed all these paintings of microscopic communities was my BA dissertation on Henry de la Beche (1796-1855) who was the first person to visualise dinosaurs as living organisms within a recognisable habitat. His image, Duria Antiquior, has many flaws, seen from the point of view of a modern viewer, but I wonder if that is part of the process? Whether, by looking critically at the product of de la Beche’s imagination, other palaeontologists of his day were able to run their own “thought experiments” (how did a Pleisosaur hunt its prey?) that in turn fuelled their own research and, ultimately, led to more informed interpretations of Jurassic life. 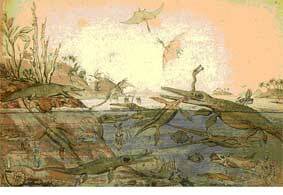 De la Beche helped people to think of dinosaurs as living animals rather than as piles of bones. 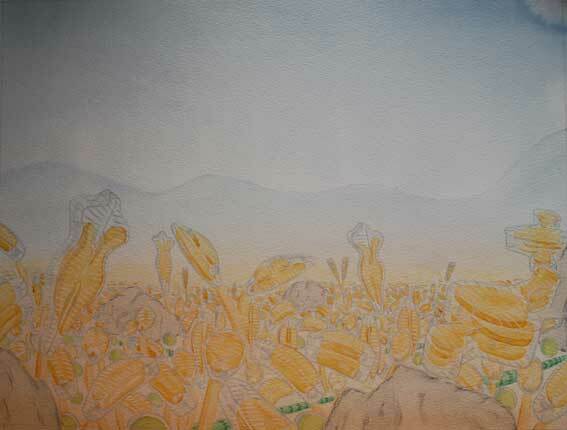 The original watercolour of Duria Antiquior is in the National Museum of Wales and can be seen at Gather The Jewels. There is also a useful Wikipedia entry on de la Beche. The Wastwater series, illustrated on my webpages, is roughly the third iteration of illustrations based on some experiments performed by Lydia King whilst a PhD student at Lancaster University. She had put bare substrates into the shallow littoral zone of Wastwater and made a series of measurements and observations over a period of six weeks as they had been colonised by microscopic algae. Most of her thesis was written up into papers but this chapter remained unpublished. She lent me the Scanning Electron Micrographs (SEMs) to illustrate a talk on diatom ecology and I started out producing simple schematic sketches to annotate the SEMs, later going back to her for the original data to give a more objective foundation to the sketches. 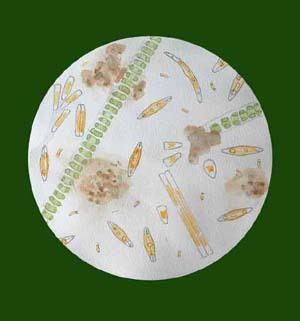 The earliest germ of the idea for this type of sketch came, I think, from looking at freehand sketches by Frank Round who was trying to illustrate the three-dimensional architecture of microalgal communities. He used the analogy of a “forest” of algae, with different layers: canopy, understory, ground layer etc. Given the extent to which grazing exerts a strong influence on microscopic communities, I think that a pasture may be a more realistic metaphor but credit should go to Frank for providing the leap of imagination that transformed the sterile view seen down a microscope into something that could be more readily visualised.